After checked in our luggage in Hongdae Room Plus Hostel, we took our first dinner in Seoul at Dongdaemun famous whole chicken – Jinokhwa Halmae Wonjo Dakhanmari (Jin Ok-hwa Original Chicken Restaurant/ 陳玉華奶奶一只雞/ 진옥화할매원조닭한마리). Where is Jinokhwa Halmae Wonjo Dakhanmari? 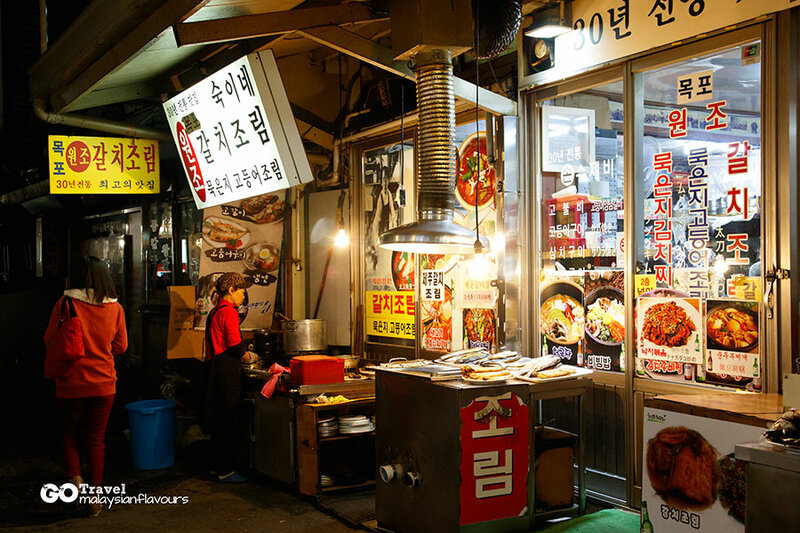 Align at Seoul subway Dongdaemun exit 9, walk straight for 5 minutes, turn left after IBK bank, you will reach a street with lots of local stalls. Walk along the street for like 1 minute, you will come to a stretch of restaurants on your right. There are many eateries in there. 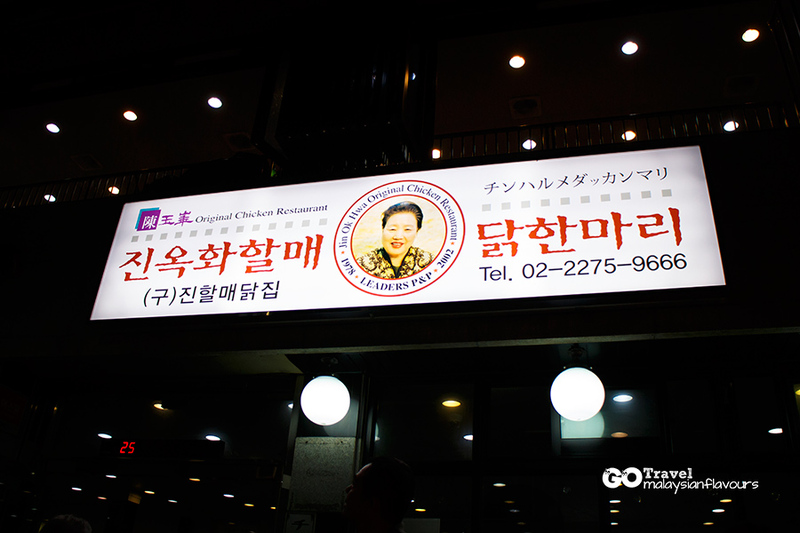 Turn right and walk until you see the sign board of Jin Ok-hwa Original Chicken Restaurant, with portrait of founder on it. 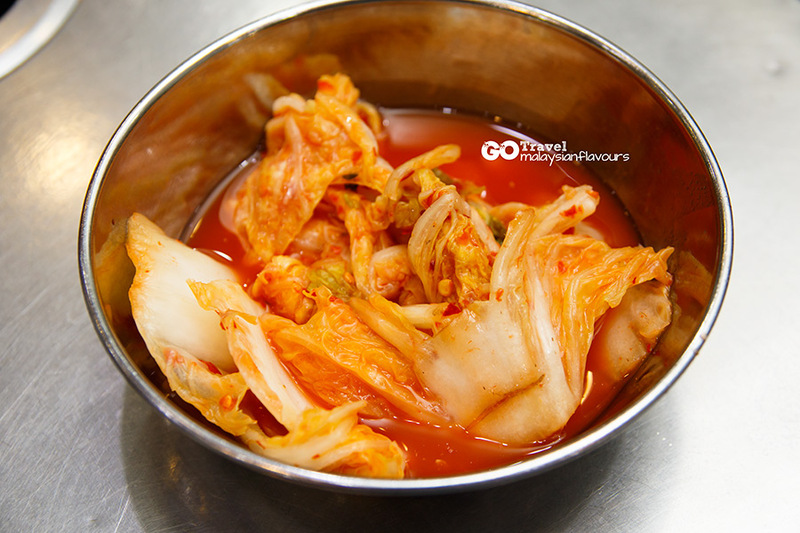 We have been hearing a lot about Jinokhwa Halmae Wonjo Dakhanmari, highly recommended by some of our friends too. 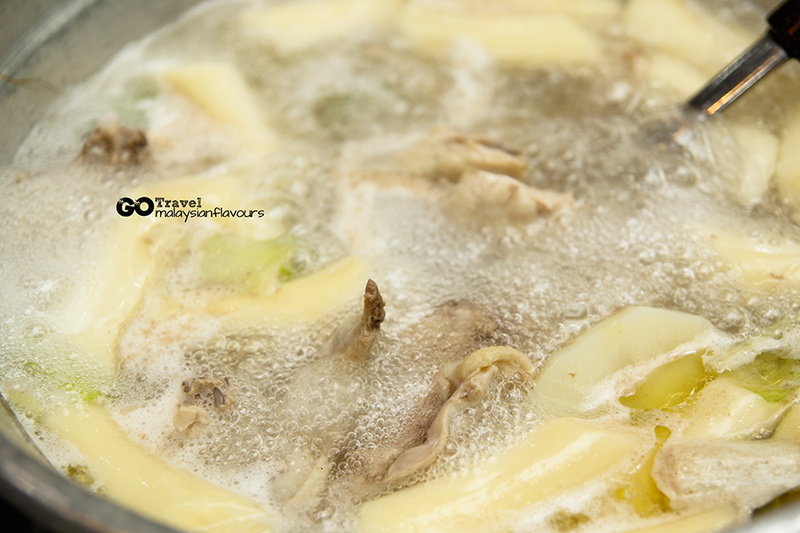 But looking at the food picture of whole chicken immersed in a bed of soup, we were skeptical initially on how delicious it could be. 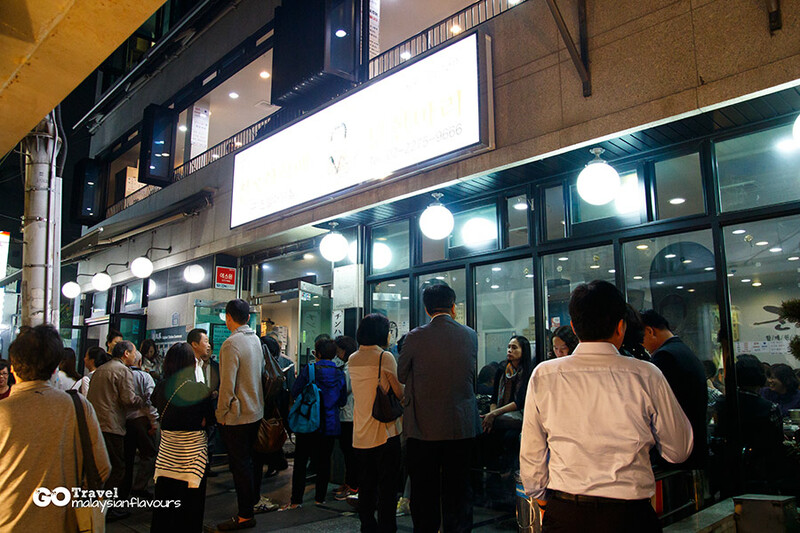 However, with a long queue in front of the shop once we reached Jin Ok-Hwa and reading on its history that they has been serving dakhanmari since 1978 with interviews by mass media, we had to say that Jinokhwa Halmae Wonjo Dakhanmari certainly doesn’t go famous for no reason. 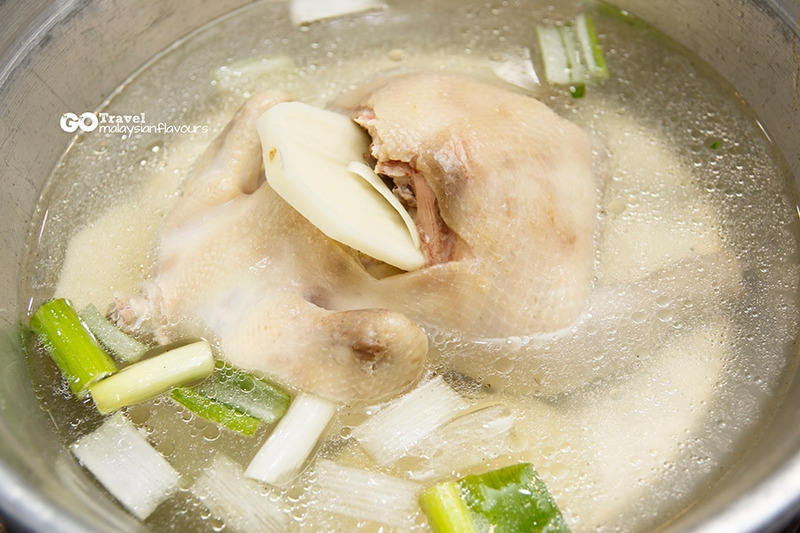 Today, this “dongdaemun whole chicken” in soup is popular not only among locals, but also tourists from different countries including Taiwan, China, Europe, Malaysia and more. To dine in, first take a waiting number if the restaurant is full house. Staffs will lead you inside when reaching your turn. Once seated down, the pot of chicken has already ready on your table, portion depends on number of guests. LOL. Fire turned on, boil the soup, and cook the chicken. You can add on sticky rice, white rice, noodles and potatoes by informing the staff. We had a portion of sticky rice. After a while, staffs came over, cut the chicken into large pieces, told us we could have the sticky rice stick first, and enjoyed the chicken after 10 minutes. Summergirl loved the sticky rice, well-soaked with flavours of chicken soup. Still chewy after boiling for some time, but of course getting “fatter”, more plump with more soup infused in it. All these years, Jinokhwa Halmae Wonjo Dakhanmari has no compromised on the quality of their chicken. They use only fresh, unfrozen chicken that is 35-days old. Smaller size, softer meat. The chicken is first boiled to half-cooked in kitchen, oil scooped off and go to second boiling in front of customers. Comparing to the chicken, we actually like the soup more. Clean and mild in taste, helmed with nourishing sweetness released from chicken. 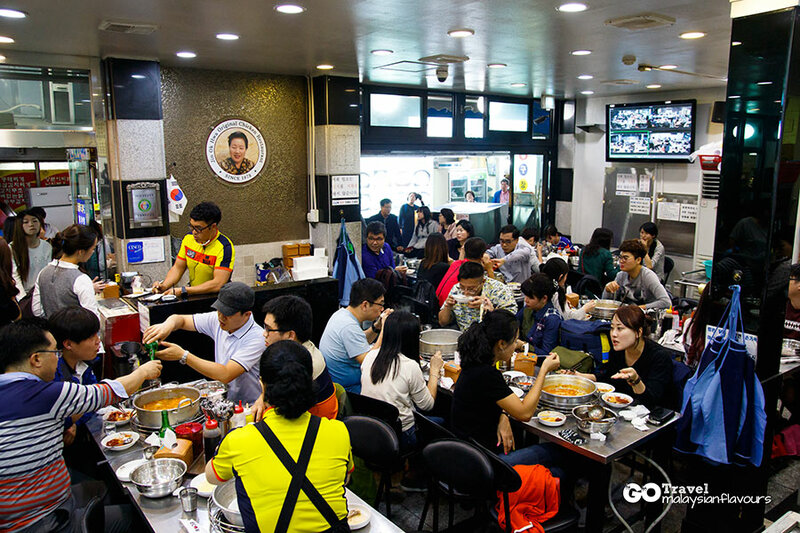 We first had it plain, but when looking around, many locals mix the soup with kimchi (*self-service at the counter, you can get iced water there too), while some had it together with Jin Ok-Hwa hot sauce. We followed too haha. Kimchi wasn’t Summerkid favourite but the hot sauce was awesome, fiery hot and spicy, opened up the appetite and greatly enhanced the whole pot of dish. However seeing that it was our first meal in Korea and we couldn’t judge the side effect yet, we took in small amount. Glad that we didn’t end up rushing in and out of toilet the next day lol. 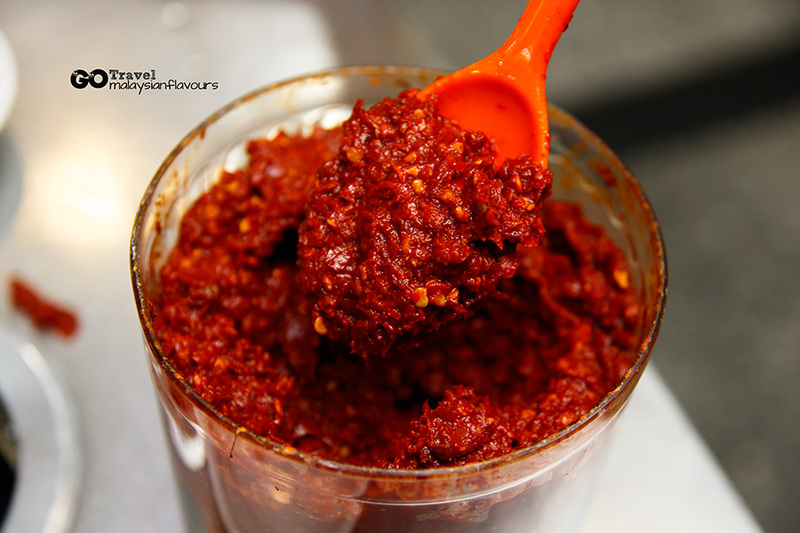 But the chilli sauce is really good, homemade by Jinokhwa Halmae Wonjo Dakhanmari. We had a quick walk around the street after dinner. 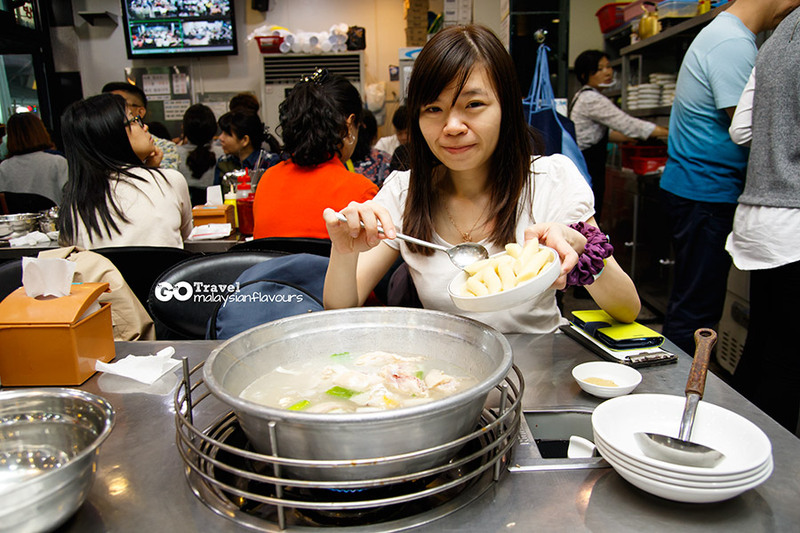 There are quite a number of restaurants selling whole chicken in soup too. Some eateries are grilling fish, and we even saw dog dishes (no no , and more no if you asked us to try) offered in a restaurant. Comments: Nice chicken soup, adding sticky rice cake is a must. Chicken is good but still, it is just chicken, cooked in its freshest state, getting the most original flavour of a chicken. How to go: Align at Dongdaemun Station (Line 1, 4), Exit 9, walk straight till you see IBK bank. Turn left after passing the bank. 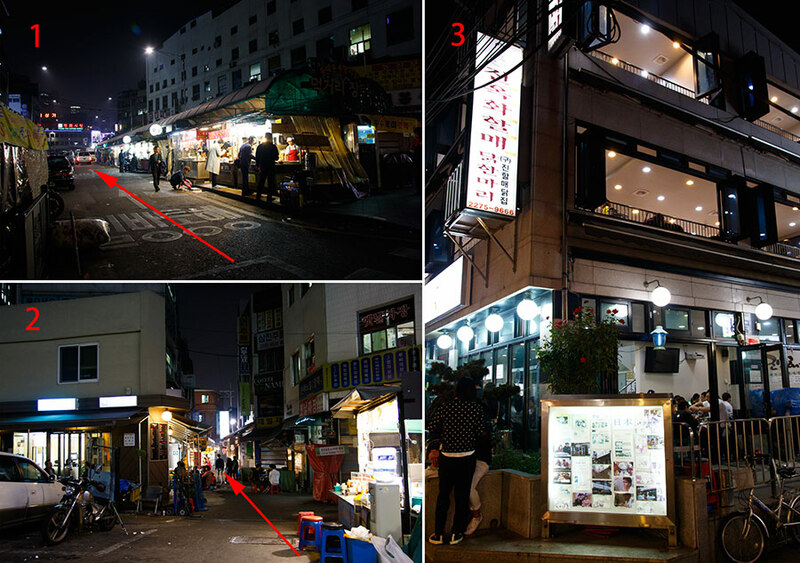 Walk along a street with many stalls for 1 minutes until you see an alley with many restaurants in it. Dear Summergirl, can you remember roughly how much you spent in the restaurant for 2pax? I will be visiting this restaurant with my sis and we want to be prepared of the price. Haha. Thank you! Harlo, if my memory serves me right, it was around RM70 for the pot of chicken. Side ingredients like rice cake and potato can be added at about 1000won – 7000won. =D Enjoy your trip in Korea!